Scripting Acorn with AppleScript can be done from the AppleScript Editor, located in your Applications folder. Paste that into a next text file in your favorite editor, and save it to file named "Resize to 50%.jstalk" in Acorn's Plug-Ins folder (which you can get to by choosing the Help ▸ Open Acorn's App Support Folder). Restart Acorn and choose the menu item Filter ▸ Resize to 50%. 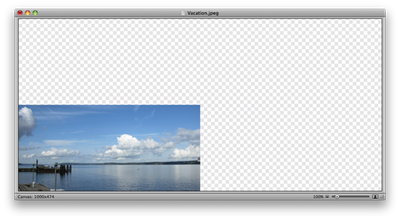 Your image should then resize to 50% of its original size. Well, first off- whenever you save a file in your Acorn Plug-Ins folder, and it has the file extension "jstalk" - it will show up in the Filter menu. Then, when the plugin is called, Acorn looks specifically for the function named "main" in your image, and then passes it a copy of the current layer's image. Nothing was done directly with the image. Instead Acorn was asked for the current document, and then resized it like in the previous script. In this example, something is actually done with our new image (which is a CIImage by the way). A new image is made by applying a transform to the original image, which scales it by 50%. Return to that image. You'll notice that when calling this function your layer has been replaced with a new layer, which is 50% of the original size. However, your overall image size has not changed because you didn't change the document's size. If you would like to see a specific example, or you have a task that you would like to see some example code for contact: support@flyingmeat.com and we'll see if we can come up with a solution for you! Here is an example Automator action that will take the images passed to it, and web export them to PNG files. set newFile to (POSIX path of anImage) & ".png"
Scripting Acorn from JSTalk Editor (Deprecated). The first line grabs a reference to Acorn, the application. It tells Acorn to open up a document, located at /Users/gus/Pictures/Jimi.jpg. The "open" function opens the document, and then on the final line resizes the image to be 200 pixels wide. Pretty simple! The first couple of lines look familiar, but then adds something a little different. 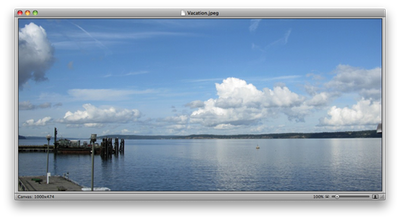 Instead of resizing the image to 200 pixels wide, it resizes to half the width. On line 5, notice the size of the image. Then on line 6, notice a variable named "newWidth" that is half the width of the current size. The image is then scaled on line 8, a copy of the image is saved as a PNG image, then written to a file. Finally the document is closed. doc.layers() - returns an array of the layers. doc.currentLayer() - return the current layer. doc.cropToRect(NSRect) - crop a rect to a particular dimension. doc.scaleImageToHeight(newHeight); - similar to scaleImageToWidth. doc.canvasSize() - get the current size. doc.setCanvasSize(NSSize) - set a new size. Acorn documents inherit from NSDocument, so you can call all the methods located in NSDocument as well. Note For App Store Users: If you've purchased Acorn from the Mac App Store, certain AppleScripts, and JSTalk scripts may not work for you because of sandboxing restrictions required by Apple. The direct version of Acorn does not have these issues.